Spring is one of the best seasons. For most, it means shaking off the snow and ice of winter and enjoying warmer temperatures. Many people enjoy spring because it is a welcomed season after the cold of winter. The warmer temperatures and sunshine have people planting and growing their favorite plants. A lawn and garden checklist can help anyone get ready for the spring and all the wonderful things they will plant in their landscape. This free template can be downloaded and used to help make gardening easy and cost effective. It can help make the daunting organizational task easy and make gardening this year fun. Using this checklist is easy. You can download it right here on this page for free. Simply fill in the types of flowers you have and how many. There are columns that ask for specifics about the flowers, like their colors. You don’t want too many of one specific flower in a garden, it can be overkill. There are many fields that can track data for you. 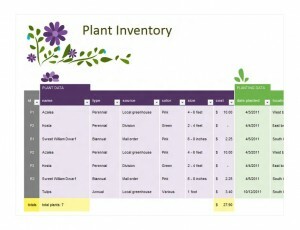 You can insert or delete columns that are not applicable to your or your garden. If you want specific information that is not on the original, one click of a button can add a column based on your needs. It can even be as descriptive as allowing you to put what colors of the flowers you have. This template is completely customizable and you can make it do and say the things you need it to. First, don’t think just because it is downloaded one way that it doesn’t fit your needs. Play around with the checklist and make it fit your requirements. Don’t limit yourself to just inventory purposes with this template. Want to create a task list? It is easy with this free and simple to use template. You can track which areas need more watering, or you can keep track of your seedlings all with the click of a button. It is gardening for the organized person. Do you think that magnificent looking lawns and gardens just happen? No, they take much thought and preparation and this lawn and garden checklist template can help. If you want your landscape to look spectacular, this lawn and garden checklist can help. Why not be the envy of all the neighbors by having a lawn and garden area that is simply amazing.